Discover how to activate positive social change through creative interventions with this introduction to the Disruptive Design Method. This is a 1-hour introductory class. 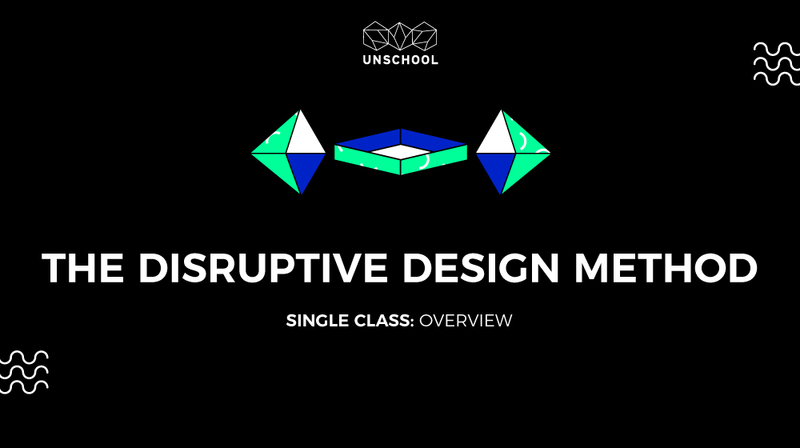 This introductory class provides the foundation for using the Disruptive Design Method, a unique three-part approach of mining, landscaping, and building to leverage positive change outcomes. A holistic approach to complex problem solving that combines sociological inquiry methods with systems and design thinking approaches, the Disruptive Design Method helps you to develop systems interventions that are smart, effective, thoughtful, and sustainable. Through this course, you will be introduced to the disruptive and creative mental tools to activate positive change. Course Synthesis - Tying It All Together! This introductory class provides the foundation for using the Disruptive Design Method, a unique three-part approach of mining, landscaping, and building to leverage the positive change outcomes. A holistic approach to complex creative problem solving that combines sociological inquiry methods with systems and design thinking approaches, the Disruptive Design Method helps you to develop systems interventions that enact social and sustainable change. Through this course, you will develop the mental tools to activate positive change by loving and unpacking problems, employing a divergent array of research approaches, moving through systems analysis, and then ideating opportunities for systems interventions that amplify positive impact through a given micro or macro problem arena. Why Settle for A La Carte, When You Can Get All You Can Learn?